This is one of my favourite wargame shows. Run by St. Helens Wargames Society (Spartans), Phalanx is accomodated in the spacious Sutton Leisure Centre, near St. Helens (UK) and it is a primary show on the wargame calendar and as a consequence is well attended by both traders and all the kind folk who give up their time to put on games. Please click Read More for the rest of this post. Having missed a few shows this year, I had a shopping list that would allow me to bring some of that unspent money into the Phalanx show. With some reports suggesting shows are loosing foot-fall, it is a plain truth that the best way to ensure the viability of your favourite shows is to bring some happiness to the traders. Some buys were going to be really simple and cheap, such as Vallejo Ivory paint to use as a base on my white uniformed napoleonic Austrians, (as I have been taking advice at TMP how best to get shaded white on a figure without dirtying everything with inks), while at the other end of the buying spectrum, picking up new forces and terrain was going to be a more substantial spend. I have been heavily distracted in 2015 with the question (or rather 'crisis') of scale. Having been happily plodding along with my 10mm / 12mm, which mates perfectly with my Kallistra hexes, I have been somewhat bitten by the beauty of 1/72 and for the first time have actually enjoyed doing a bit of modelling and painting for its own sake while investigating that scale, though I have a deep-seated sense that what I am already doing is the best path for my circumstances of limited gaming and storage space. - so some frustration here! 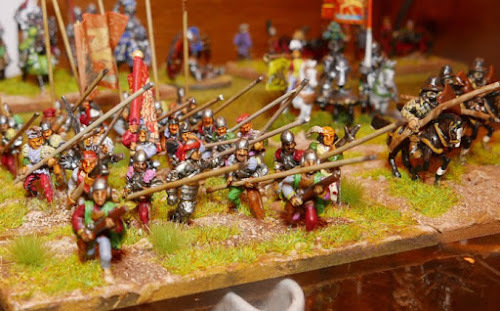 This flirtation means that 10/12mm, 15mm, 1/72 and 28mm and associated terrain projects all share the painting table as I explore the bigger scales, so the distraction in time and cost is significant. So I went to this show with as much anticipated interest in the game tables as anything else, just looking for that inspiration that might help me focus better on a single scale, though of course the bigger danger is that I will actually pick up a new project! The Phalanx advert listed a game that a group were putting on in 28mm using hexes - was that going to be a Commands and Colors type game or something new to me? - It sounded interesting and there was plenty to look forward to. I actually get a bit excited the evening before a show ... like I am going on holiday or something! The only job that needed doing in the month before the show was to crank up the painting of Kallistra 12mm ACW Union, to finish off the two armies that were bought at the show last year, so that the lead mountain was clear (well almost, I have French and Austrian Napoleonic armies from Pendraken still packaged) enough for a guilty conscience to allow the buying of more troops - and this was done ...... just! though basing still remains task. I had put a pre-order in with Kallistra for some terrain, including their big 15 hex hill. Also, to expand the now painted basic ACW armies, I had ordered a cavalry pack for each side and a pack of Zouaves from them. Pendraken took another pre-order, this time for some German and Soviet WWII vehicles that I wanted as singles or pairs, because at the shows, they are sold in packs of 3. A single pack of 'Alien Creatures' was added, just so I could assess them for a future project (an itch that needs scratching since my recent watching of Prometheus on DVD). The intention being that these figures, plus my unpainted Pendraken 10mm French / Austrian forces were enough to keep my painting table busy enough for the next 12 months. Anyway, on with the show. As always, I arrived too early and had to eat a bacon barm to pass the time. Like last year, the cafe was closed, so outside caterers (Suzies) that serve from a vehicle came and did a fine job - though the persistent drizzle this year meant there was no outside seating. I paid the entrance fee and got badge number 4. Having not brought anything for the bring and buy, it was straight into the gaming hall and a quick once around dash to see what was what. I spotted that Monarch Miniatures had a couple of the mini Battlegroup rule sets left and were selling them for £5 (usually £10), so I picked one up in case they went before I could come back. The next stop was to visit the various game tables looking for that inspiration that usually leads me towards an unplanned purchase. Because I am male, stupid and getting older, the shopping list was of course forgotten about and I allowed traders to charm and hypnotise me with their wares, but what a great day! 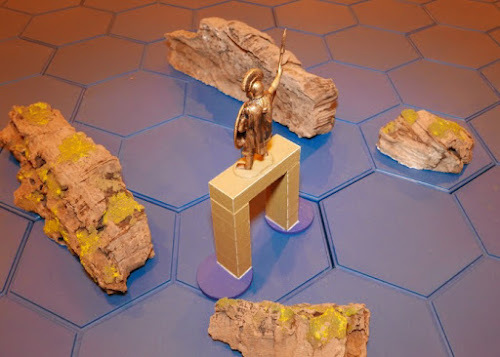 The hex game with 28mm figures turned out to be a hexed game using wooden blocks in the Kriegspeil style and we had an interesting chat on how he had gone about doing that. Running through some of the games (sorry if your game is not here or is here and I have mis-labelled it or not properly attributed to the people kindly putting the game on), I managed to get a few decent shots, but they are all a little dark and have a yellow cast thanks to the non-photo friendly sodium lighting in the hall. First up, this caught my eye because you don't often see a Hungarian tank on the table ... and probably less so with the Rumanian infantry following. 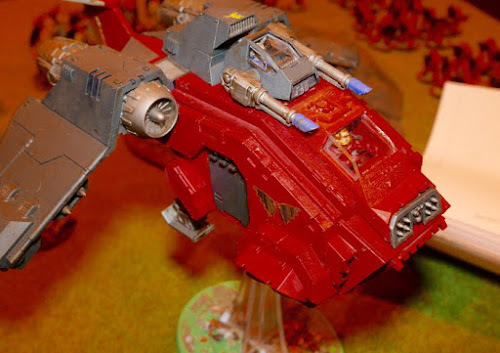 Two blokes from Oldham Wargames put this one on and were clearly having a lot of fun. The Society of Ancients stand. They had part of their stand set up so that punters could sit down and play a light version of DBA. There are a bunch of 25mm armies down one side of the table, you just pick the one you want and play against them (which I did later). The advertised hex game with 28mm figures by Corbridge Old Contemptables that I mentioned in the opening of this post, turned out to be a hex game without 28mm figures. 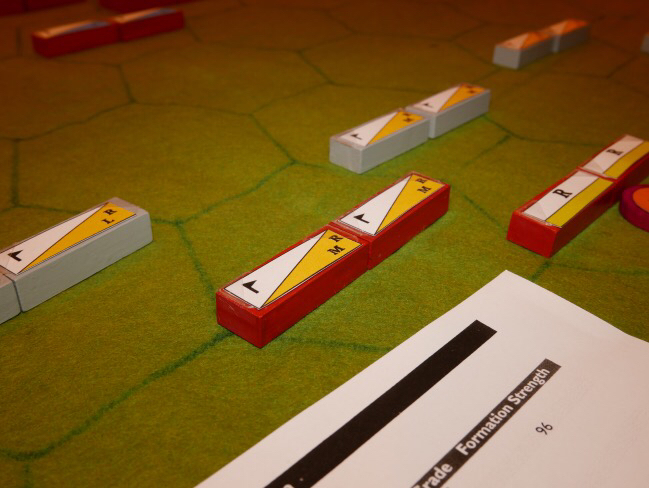 Rather they were using blocks Kriegspeil style, but within hexes. 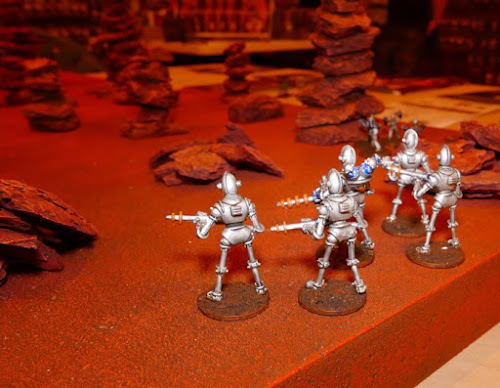 The blocks seemed just the right size for this format - The chap was very pleased with this potential universal system .... though he smiles and admits that a couple of weeks ago he had just started painting a new army! He has rather cleverly put some sort of photo mounts on the corners of the blocks so that different paper units could be slipped under the mountings and look like they are fixed onto the block. 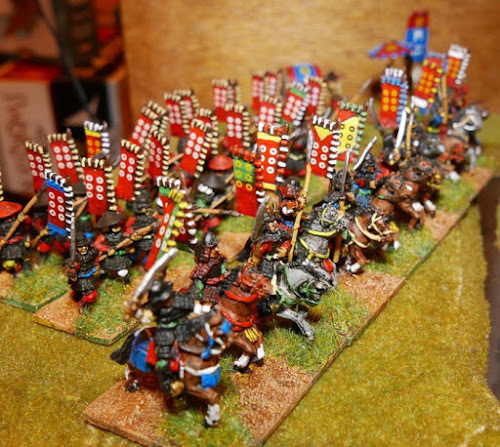 This way they can use the same blocks over and over, with different armies inserted onto each block as needed and customise the blocks to whatever battle is being fought. Ansty Castings had a cracking looking and unusual game going on in front of their stall called Agro Ball. The scene has one part of a football stadium plus the streets and housing that lay outside, looks like the scene is set for clashes between the police and those 'Lookin fer trouble'. The scenery was very good and the darkness of the street buildings set a distinct mood - looks like an innovative game. 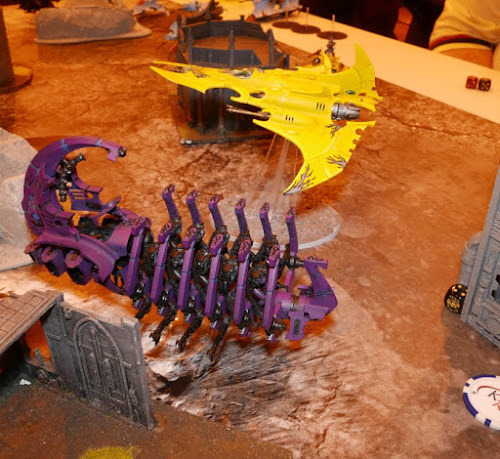 Now I think I have this right, Northern Warlords had a few tables running with a Warhammer 40k tournament in progress. There were some smart models on show, with plenty of obstacles for low flying vehicles to negotiate. 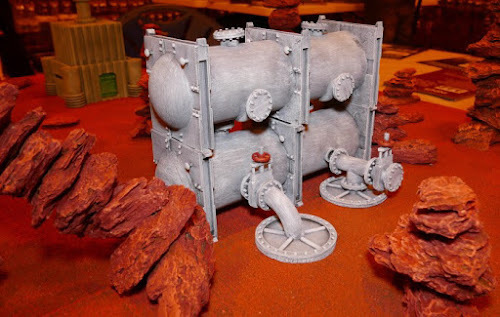 I think it was their tables that had silo structures, obviously made from empty tinned cans (Spaghetti Bolognese I was reliably informed) and roughly painted grey and properly mounted in groups of three onto bases. They brought smiles from passers-by (me) and some nods of admiration (me) for something so easily but rather effectively put together. 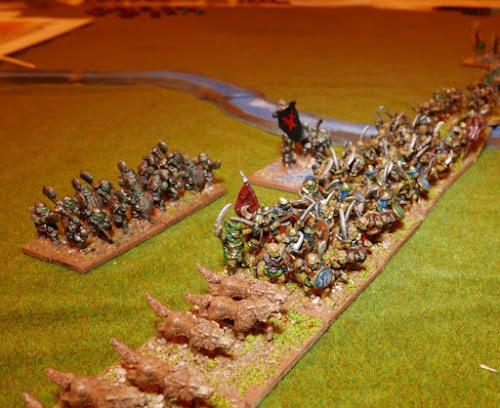 Polkovnik Productons put on one of my favourite tables, based on The Hobbit - Battle of 5 Armies with Sword and Spear Rules. (Sorry for the first dreadful picture - the sodium lighting is hard to defeat). Having just seen The Hobbit on the telly last week, I was quite taken by the work that had gone into the scenery. I had seen the chap walking across the car park with a big chunk of this board (the corner section below) and was immediately intruiged, as the work that had gone into it was clear (just stare into it and see). It makes a wonderful backdrop to the game. 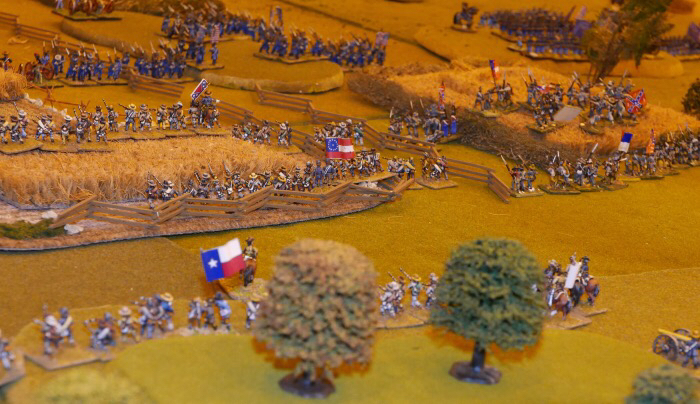 This is just a general shot of the armies (15mm) closing for action. I'm pretty sure that this game was put on by Mailed Fist. It looked quite spectacular. I sat and observed for a while (being in an advanced stage of doing my own 10mm ACW armies), I think they were using Fire and Fury rules. This is a view of the left side of the board (below) and it has a realistic look. This view (below) swings around to the right half of the table (that sodium lighting is playing up here). The nice thing about their displays is that they use a small board, the kind of thing we could all put on a kitchen table without distracting from play or terrain qualitly. I thought this building / plant set amongst the planetary red background look great. 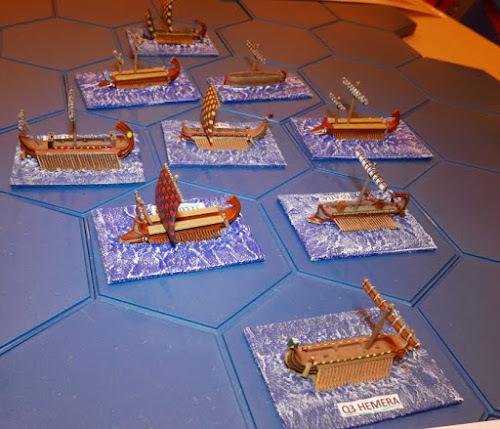 East Lancs Wargames Association put on a lovely large Greek naval action using Kallistra blue hexes. This water feature looked quite fitting (heroic) - though Nessie the Lock Ness monster, a fun 3 piece serpent that was swimming near to this this monument while the game was being set up, nearly stole the limelight. 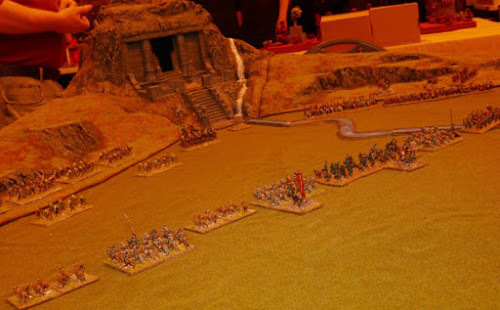 Eventually I managed to get my bum on a seat for a five minute breather and was invited by the delightful Martin Charlesworth who was working the Society of Ancients table with Phil, to have a bash at his one page DBA. He attends this show every year and is unstinting in his enthusiasm to get people playing this game. He allowed me to choose an army. 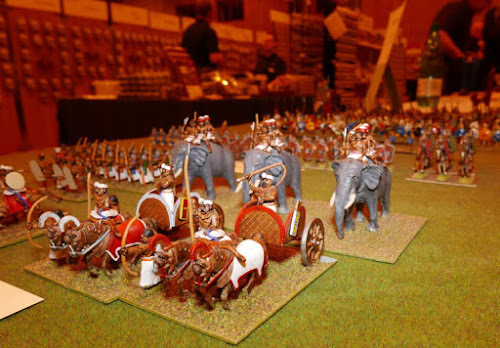 I quite fancied those Indian elephants in an earlier photograph, but feared I wouldn't know what to do with them, so I went for the safe Roman army. He allowed me to choose some terrain, so I picked two woods to cover my flanks. 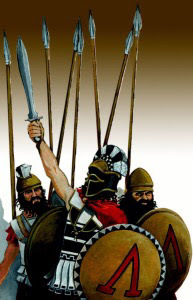 He picked the Persians (see above photo - doesn't my line look splendid - how could I lose). He has a lovely relaxed playing style and just kept things moving along to make it work - I'm sure he new I was doomed before the first die was rolled. 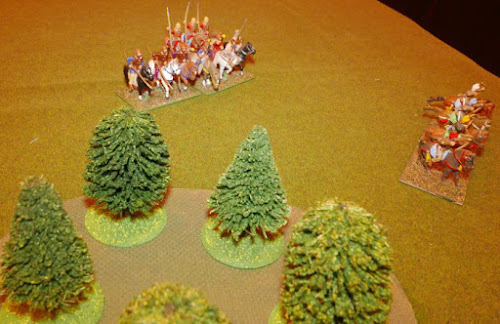 His horse archers and heavy cavalry immediately peeled off and started to move around the wood on my right. 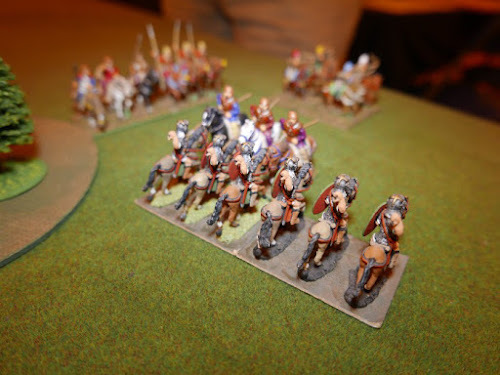 I started to get my cavalry and archers onto my rear right to await the certain contact. His Persian foot advanced very slowly, so I was guessing that he knew his cavalry manoeuvre was going to hurt and be enough to seal my fate. My own cavalry charged into the middle of his cavalry while they were wheeling, removing one base - Huzzah I thought, but it was but a brief moment of success. My Die decided that it would only ever roll a 1 for pips and a 2 in combat. With that and the obvious skill and experience of my gracious opponent, I was quickly seen off. Thank you for taking the time to show me the system and letting me play with your 'veteran' collection - very enjoyable. 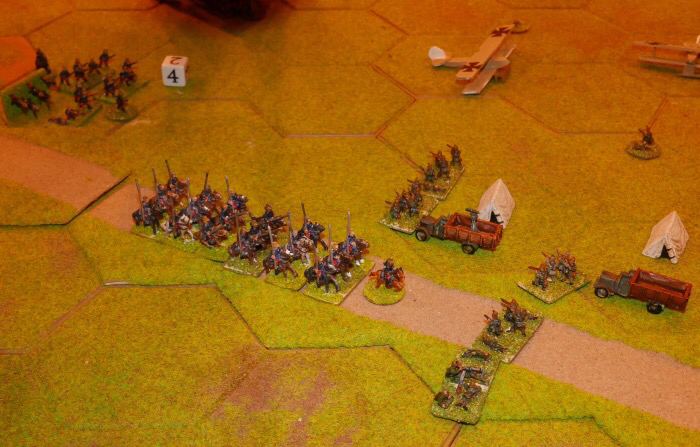 Kallistra had a WWI game going, which showed off their 10/15mm trenches nicely. I had a quick chat with Paul at the table, who was attacking and I suspect glad for a break from advancing into the enemy machine guns and then picked up my pre-order from Sally. I added a few more packs of ACW troops to get the benefit of their handy 6 blisters for 5 offer. This is the town that sat close behind the trenches. 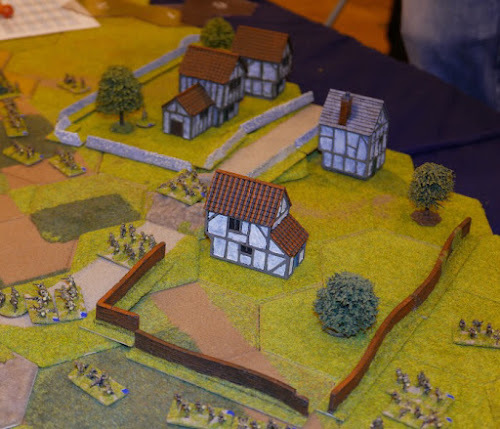 Another game from East Lanc's Wargamers, The battle of Wakefield - A nice scene here, especially the modelling incidentals such as that barrel leaning against the wall and the pig in the pen (bottom left). 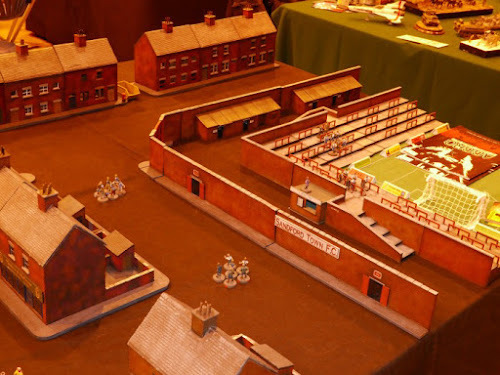 Liverpool Wargame Association always do the show proud and understandably so as it is an excellent recruiting ground for them. 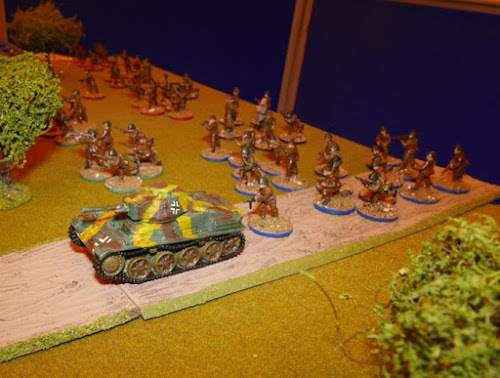 They had a mix of painted figures on display, boardgames and a demo WWII game. These painted Samurai (by Mac I believe) are a treat, they have a ton of contrast in them. Likewise, these armoured pike have nice attention to detail. I struggle to get such vibrancy into my stuff. 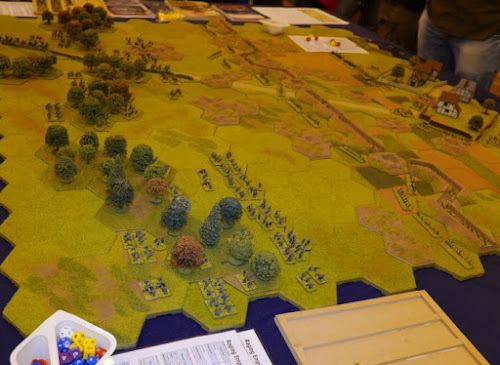 Their demo game was on a large table, with an approach over hedged fields to get into the outskirst of a town. I really liked this building (below), with what looks like the business end of a drill, it makes a super city (Stalingrad) factory ruin and reminds me of the box artwork used by the Plastic Soldier Company for their WWII German infantry. 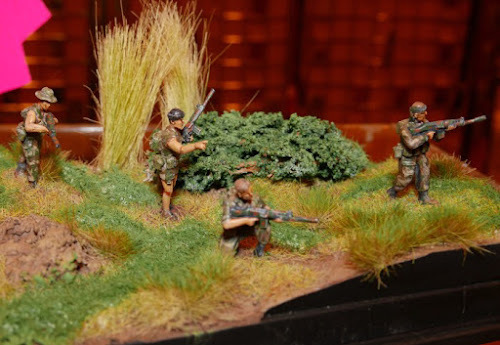 On passing one of the traders, I was quite taken by this little diorama and the quality of Under Fire's 20mm moderns. They are metal and have a lovely slim proportion and the weapons are nicely detailed. 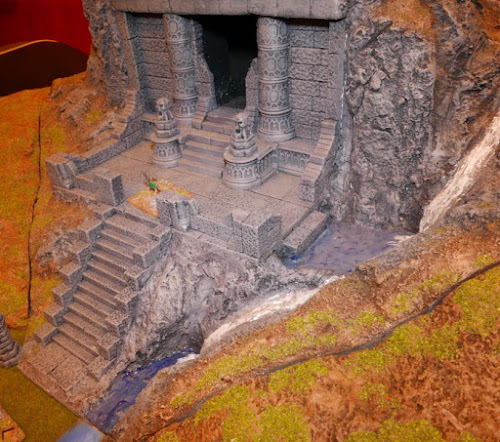 If you are looking for something like this, his web site is underfireminiatures dot com. 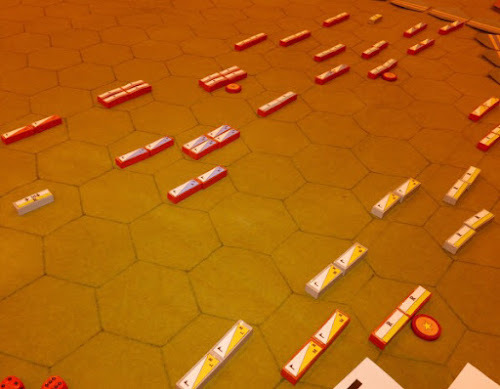 It would be imposible to do a round-up of this show without highlighting what Bob Martin of Lancaster Wargames was doing for his (always popular) participation game. In recent years he has done Dr. Who scenarios and a superb 'Where Eagles Dare' scenario (see last years report - link at the foot of this post). This year was the story of WWI cavalry doing a night attack on aircraft on the ground. Just to stand back and watch his guest players smiling and having fun while he energetically umpires the games, gives his table a special place at this show. Another chance of a sit down, this time at the table run by Grim Tree Games. They had a demo going of Kings of War, just one of the games that his store sells. The chap was really friendly and helpful, showed me boxes of the product and gave me a copy of the rules. This is just one of the games that he sells, but he has a lot of confidence in the product, so gives it good support. I am interested in doing some fantasy gaming and so this encounter was really helpful. What I like about these rules is that the figures are based in a permanent block, so scenically can look wonderful. Click on the photo to see some of the animation in the faces. 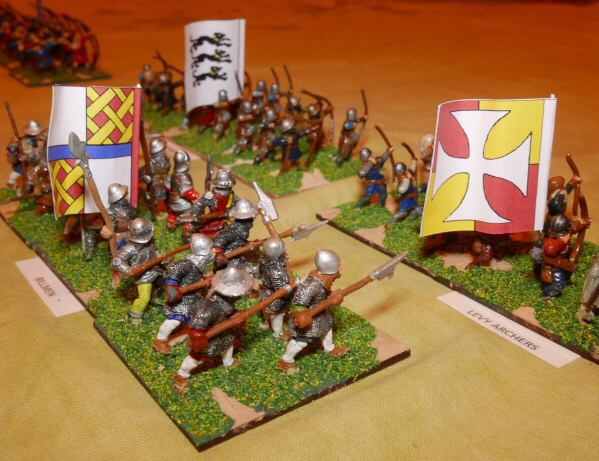 The Lance and Longbow Society put on a nice game with a local theme. It is 1425 on the open land, north of Liverpool and the Stanleys and Richard Molyneux are about to come to blows. I think the Poleaxe rules from the Lance and Longbow Society might have been in use. And that rounds out the Photographs. By the end of the day, I had seen plenty to inspire and bought things planned and things unplanned. One of the nice things about a show is that you can pick up all those little odds and ends that might usually be awkard to find or not even occur to you. I got some of that flower type material that gets added to bases to give some bright texture and discovered 10mm ruins by Total Battle. One thing that was very noticeable and that was the proliferation of MDF buildings and bases. They were everywhere and getting increasingly clever in what they can represent. 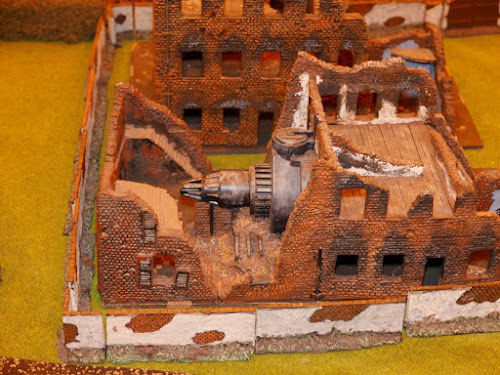 I picked up a variety of bases from different vendors and a couple of small 15mm Stalingrad style ruined blocks from Warbases. Did I start a new project ...... well yes. 10mm Marines and Aliens from Pendrakens Sci-Fi range. And did I buy a box of Games Workshop 28mm Cadians the other day to do the same thing ..... well yes! As for deciding on scale, well I suppose the above paragraph is indicative of the continuing conflict. I would say most stuff in the room was 20mm upwards and it looked lovely. 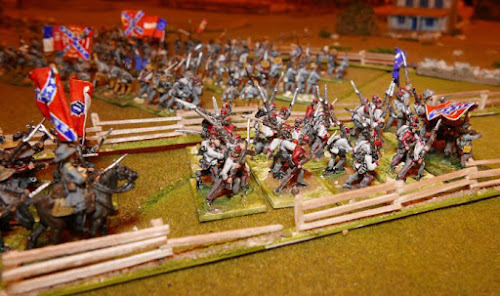 I saw some unboxed 28mm Napoleonic infantry on the Bring and Buy, but felt that they were too big for my table, but then saw some painted as a single stand of 12 men (Liverpool wargame Association display) and they just looked great and very tempting (though realistically still big for my table)......... and then to bring me back to my senses, I have my nice new shiney 10mm JS II's from Pendraken, which do look rather spiffing. So my purchases remain 10mm / 12mm related, while a desire for the bigger stuff still lurks. Great report Norm! Will share on the SoA facebook page too. Excellent report full of personal insight and a great cross section of pictures from the day. Thanks for taking the time to attend and write the blog I hope we can keep you coming back each year. Great to see that you took the time to depict most of the games.